Early this month, Felicity Duncan questioned the value of “Big Deals”. In particular, two made by 3G Capital – Kraft Heinz and AB Inbev. By year-end 2018, their market cap had fallen from previous heights by 50% and 43% respectively. Vitaliy Katsenelson recently attributed value loss to huge premiums paid and practical difficulties faced in making acquisitions work. He’s dead right but could they be “effects” of a much deeper “root cause”? Do most CEOs pursue the wrong goal, and have the wrong measures and incentives? For many years, I believed management’s only legitimate purpose was to maximise the value-of-the-firm (VOF) for shareholders. For a listed firm, the VOF is the market cap – number of shares issued multiplied by the share price. Today, I agree with Jack Welch. Some years after his retirement in 2000, he said “maximising shareholder value is bunk … the dumbest idea in the world”. If he really believed what he said is moot in my view but let’s give him the benefit of the doubt. Over a 40-year period, he and Jeff Immelt, the successor he chose, bought more than 2,000 companies. 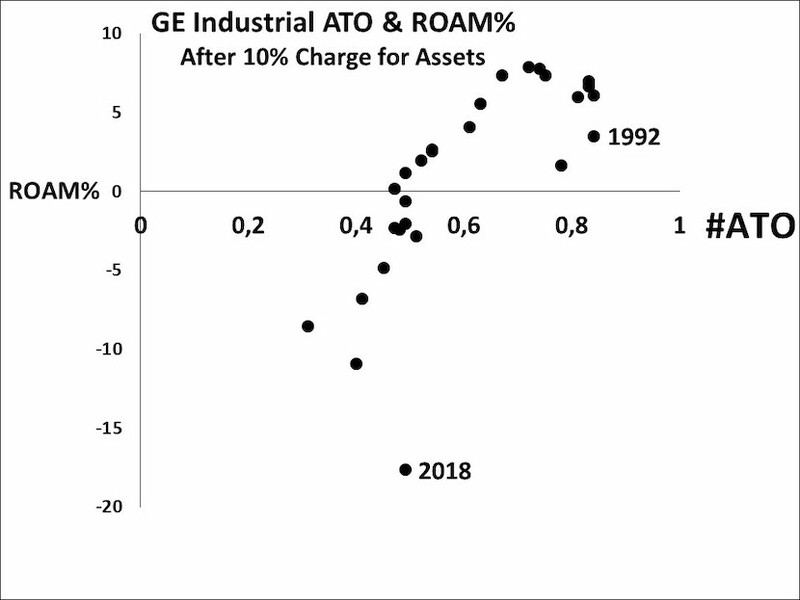 They took the asset base from $21bn to a height of $800bn in 2008 before GE’s break-up started. In the process, they made themselves very rich indeed. Sadly many CEOs aped his approach and are still doing so. Last year, GE’s market value had fallen from a height of $500bn in 1999 – at that time the most valuable company in the world – down to $71bn. That’s back to where it was in 1992. A fall of 86% and spectacular, massive value destruction. Possibly the biggest ever? Do the math and convert it to Rands. Jacob Z would never cope with articulating the number. Doesn’t that also mean that Jack and his chosen successor wasted their undoubted talents in pursuit of the wrong goal? If he really meant what he said, despite being lauded as the greatest manager of the 20th Century, shouldn’t his real claim to fame be that he was an exemplar, not of managerial effectiveness, but for showing what bunk chasing shareholder value is? Even a classic example that supports Dunning Kruger’s research into people behaving stupidly without knowing it? The only valid measure of a manager’s competence is a productivity ratio – a Resource in: Result out ratio – and fundamentally, the value arises from productivity of a firm’s asset base. Especially the sales productivity of assets. In the end, the long-term value of a firm derives from a focus on customers and productivity through its people. But throughout their tenure, Welch and Immelt, in the mould of most CEOs, focused primarily on growth by acquisition. Their key productivity measure was profitability of sales – not assets being managed. The operating margin achieved was never less than 20%. Not half bad you might think. … and by 2018, Danaher, a company in its sector with only 15% of GE’s asset base, was as highly valued as GE. So, how does this link to 3G Capital, AB Inbev and Kraft Heinz? Relative ATOs amongst peer firms in the Food and Beverage sectors show once again how important a measure it is. 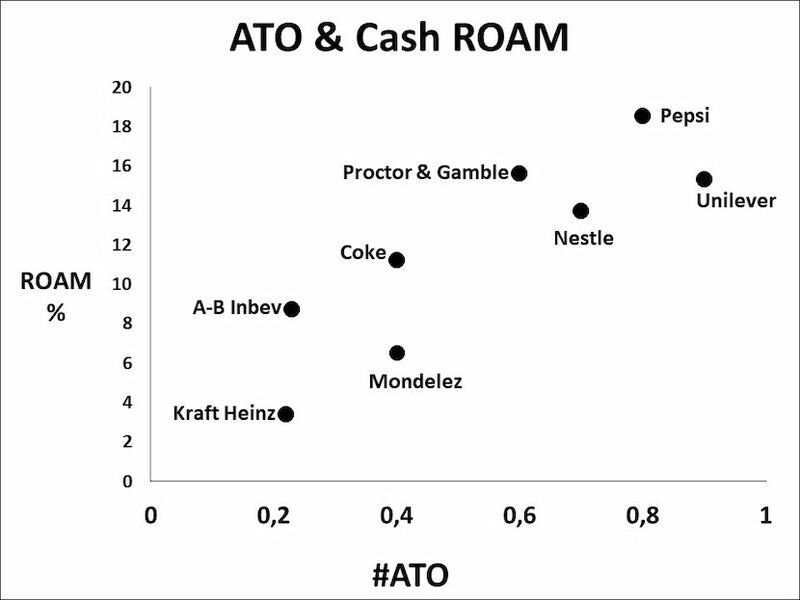 As you can see, Kraft Heinz and AB Inbev, because of huge premiums paid, languish way back in the field with their ATO and Cash ROAM returns. Unilever and Pepsi lead the pack and in sharp contrast to the bankers and accountants running 3G Capital, their prime focus is not on shareholder value and dancing in time to the tune and quarterly beat of bankers and analysts. It’s on customers, their people, suppliers and society as a whole. The level of Cash ROAM also has a big impact on the ultimate profit measure – economic profit after deducting a 20% cost-of-equity from Cash Profit after tax. 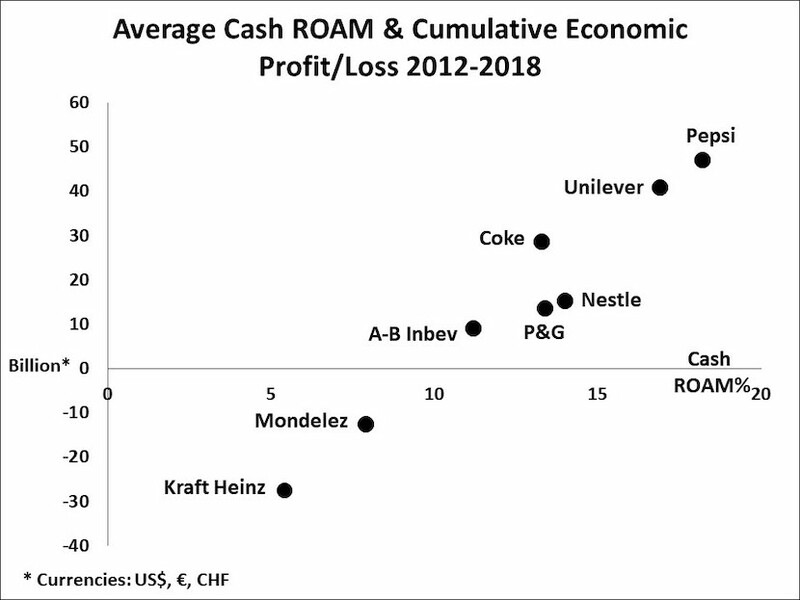 Once again Kraft Heinz comes last with an accumulated economic loss since 2014 of close to $30bn. Announcement of financials for 2018 have been delayed, so the situation will be worse I suspect. However, on the upside, fundamental productivity is still healthy despite the firm’s problems. Its Cash ROAM% on tangible assets has averaged close to 35% over four years. That’s why the financial people running 3G focus on this sector. It is a very attractive one. They follow the path “discovered” by strategy guru Michael Porter – if you monopolise your market, you get the power to set prices. An insight that made Porter very rich but one that businessmen have known since the days of the Pharaohs and why today’s CEOs use each and every artifice they can to achieve it. Acquisitions and “orderly market arrangements”, a euphemism for cartels, are favoured tactics. 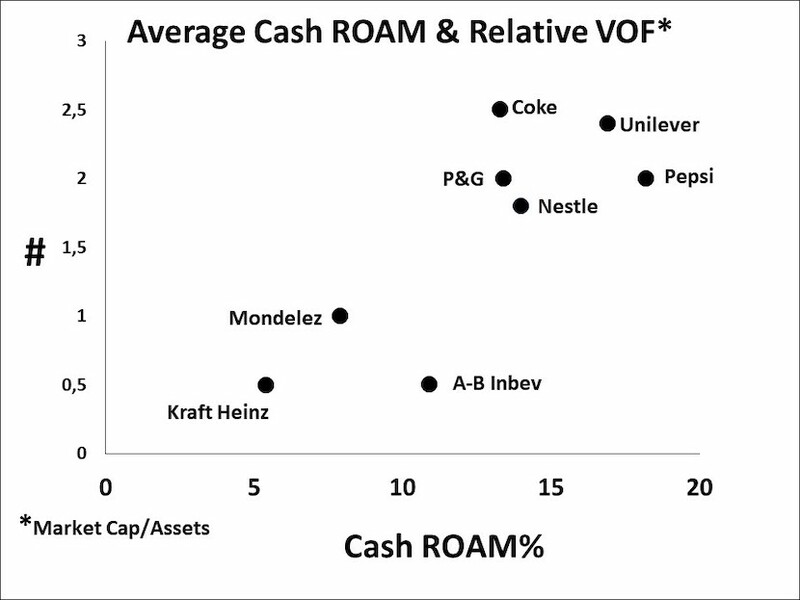 As to AB Inbev, despite its low ATO, it has a Cash ROAM% of 9% on total assets and 40% on tangible assets. This enables it to gain a cumulative economic profit, despite a couple of loss years. For every $1 of sales, AB Inbev generates a profit in cash of 40c. However, for most firms with a very high sales margin, unless it’s based on fundamental productivities and not premium pricing, they create a protective umbrella for low-cost producers to enter the market. With a constantly low relative ATO, they sow the seeds of their own destruction. 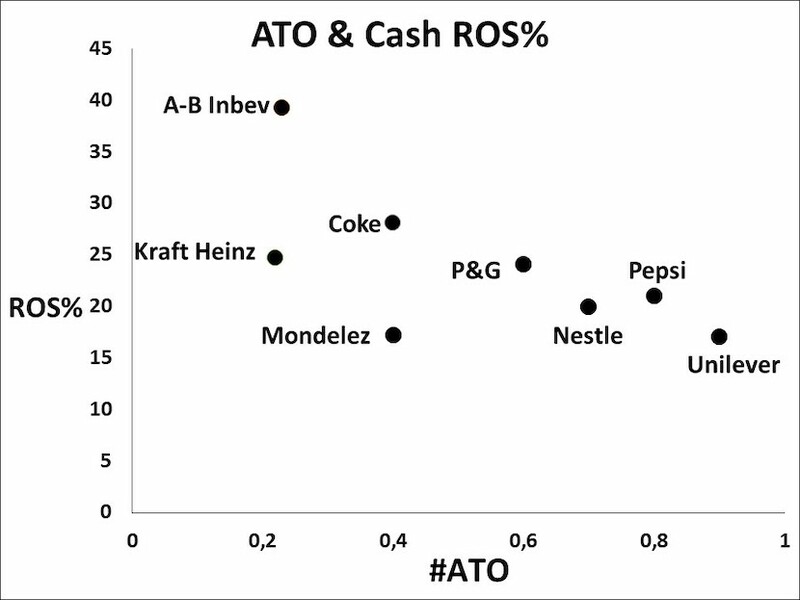 Over time, the firms with higher relative ATOs will beat the ones who focus on achieving a higher ROS. It’s a guarantee. Because high market share and high returns tend to go hand-in-hand, CEOs, encouraged by the bankers, want to do the big deals. 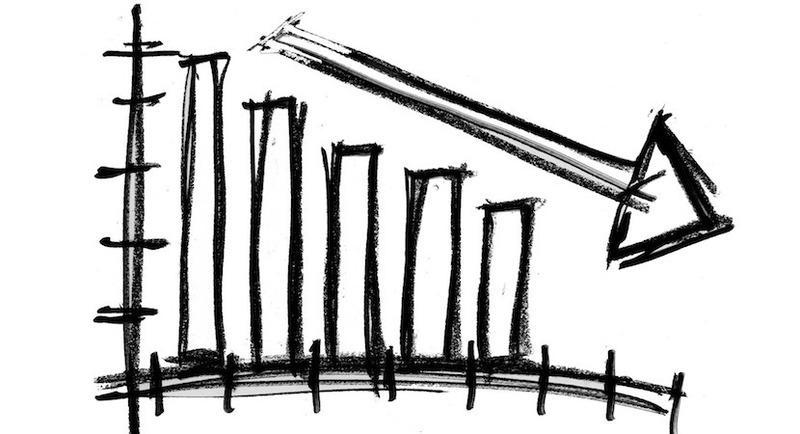 However, market share and profitability are not a function of cause-effect – only a correlation. You can form your own conclusions as to what really matters in the long run, but in the end, it all comes back to people. AB Inbev is run by a man who is not only an engineer but a banker – not a promising combination when he’s backed by accountants focussed on cost-cutting and ways to lift prices. Their primary concern is numbers, not people. There has to be a balance between people and numbers and a balance in numbers between Return-on-Sales (ROS) and Asset Turnover (ATO). To achieve it requires education and that seems rare in most firms if you judge them by the numbers they get. Financial ignorance is one of the biggest barriers of all to sustainable productivity.